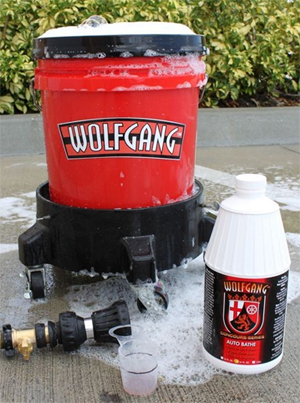 Home > Shop By Brand > Wolfgang Concours-Series Car Care > Wolfgang Auto Bathe 128 oz. Free Bonus! For a limited time, Receive a FREE 12 oz. refillable bottle with your purchase of the gallon size of Wolfgang Auto Bathe! Now there is no need purchase a separate bottle, just to use your favorite Wolfgang Product! Been using this auto bathe for almost 2 years now. It achieves a wonderful finish after use. Good suds that holds and leaves my car CLEAN. Cleans car, drys fast on paint and doesn't give you much suds. You need a second person to follow behind with hose. Smells good for what that's worth. Save your money and go to Autozone for McGuiars Gold Class. Works great. 2 ounces in 5 gallons of water seems like a perfect ratio. ProsCleans good without harming wax.